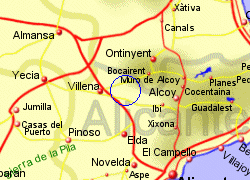 The small town of Biar lies 40Km inland from Alicante city, at around 700m above sea level in the foothills of the Serra de Mariola which rise to over 1300m to the east. 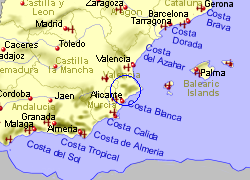 The town is dominated by the Moorish castle dating from the 12th to 15th centuries, and having been partially restored in recent years. 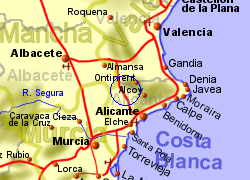 Map of the Biar area.